In 1966, Time magazine famously examined whether the United States was on a path to secularization when it published its now-iconic “Is God Dead?” cover. However, the question proved premature: The U.S. remains a robustly religious country and the most devout of all the rich Western democracies. In fact, Americans pray more often, are more likely to attend weekly religious services and ascribe higher importance to faith in their lives than adults in other wealthy, Western democracies, such as Canada, Australia and most European states, according to a recent Pew Research Center study. For instance, more than half of American adults (55%) say they pray daily, compared with 25% in Canada, 18% in Australia and 6% in Great Britain. (The average European country stands at 22%.) 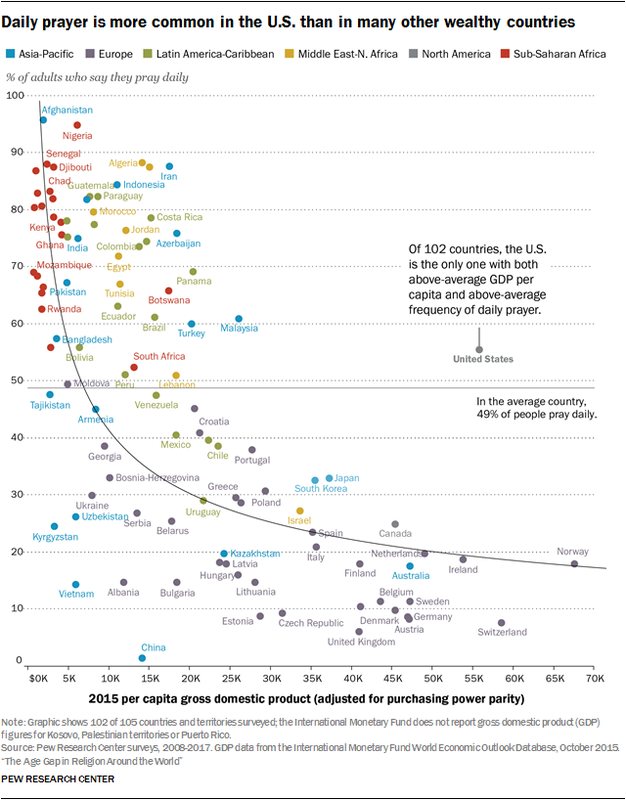 Actually, when it comes to their prayer habits, Americans are more like people in many poorer, developing nations – including South Africa (52%), Bangladesh (57%) and Bolivia (56%) – than people in richer countries. As it turns out, the U.S. is the only country out of 102 examined in the study that has higher-than-average levels of both prayer and wealth. In every other country surveyed with a gross domestic product of more than $30,000 per person, fewer than 40% of adults say they pray every day. 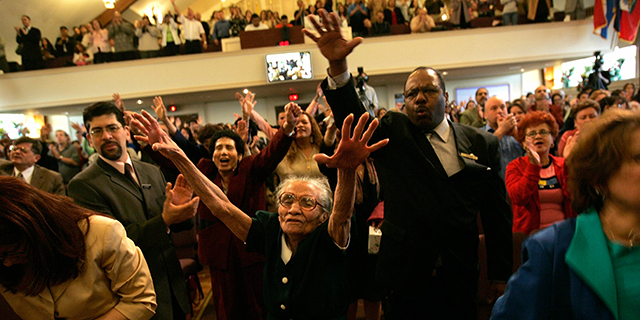 One idea popular among modern sociologists for a number of decades held that America’s unregulated and open religious “market” – where different faiths compete freely for new members without government interference – has fostered fertile ground for religious growth. 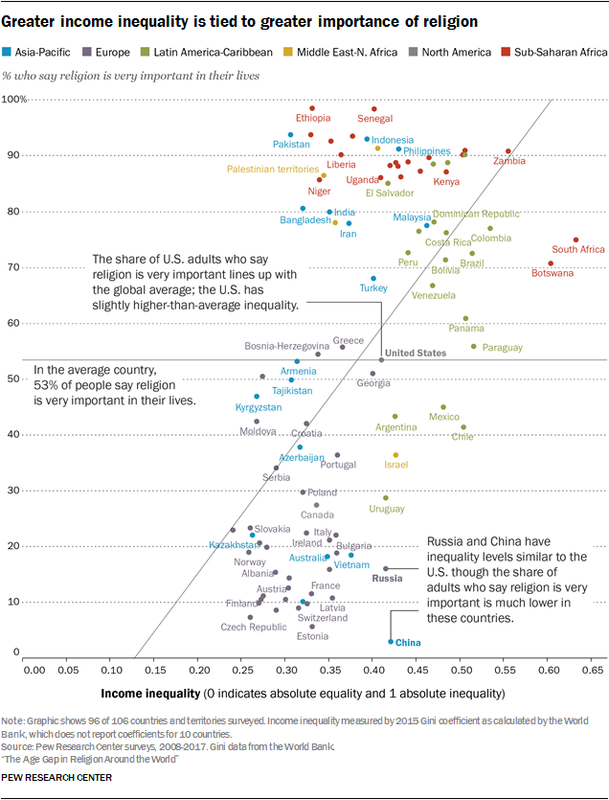 More recently, some sociologists have argued that there is a link between relatively high levels of income inequality in the U.S. and continued high levels of religiosity. These researchers posit that less-well-off people in the U.S. and other countries with high levels of income inequality may be more likely to seek comfort in religious faith because they also are more likely to experience financial and other insecurities. But even though the U.S. is more religious than other wealthy countries, it hasn’t been completely immune from the secularization that has swept across many parts of the Western world. Indeed, previous Pew Research Center studies have shown slight but steady declines in recent years in the overall number of Americans who say they believe in God. This lines up with the finding that American adults under the age of 40 are less likely to pray than their elders, less likely to attend church services and less likely to identify with any religion – all of which may portend future declines in levels of religious commitment.